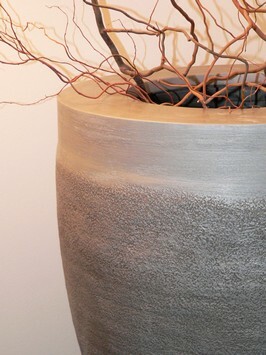 MARUBI specializes in artistic creation of unique large-scale vases and vessels. MARUBI vases are special particularly for their size, shapes and designs, as well as materials, which do not suffer from changes in weather conditions and cold. Each piece is an original. MARUBI vases are intended for the architecture of both indoor and outdoor spaces. They can be placed to representative rooms of restaurants, hotels, lobbies, offices, halls, showrooms, swimming pool halls, gardens, winter gardens, residential spaces, terraces, parks, etc. They can be used as solitaire pieces, lightened in many ways, installed on columns, or used with decoration. If required, the vases can be adjusted to serve as fountains or waterspouts, for example, in swimming pools, parks, or indoor representative spaces. Just like statues, they become striking and valuable elements of any interior or exterior space. Thanks to these unique vases, MARUBI has become an internationally acknowledged brand. The name, which sounds African, actually has its origins in old Japanese and consists of two words: "maru" – round and "bi" – beauty.